Today I'm showing you the paintings I did after Terry Miura challenged people to paint from his photo of an urban environment. Go take a look at his original photo. I don't get to view things like this shot much, so it was a lot of fun taking on the challenge. The idea was to take a densely packed and busy photo and find ways to simplify it, perhaps by cropping, but also by resisting the temptation to paint every detail there. I love a challenge, so I was up to give it a try. Here's my first one, my usual size, 2.5" x 3.5". I was intrigued by the density of the small shapes and colors, but attempted to keep it unified by values. Close one eye and squint and you'll see the big dark shape on the far left, the medium-dark shape in the middle, and the medium and medium-light shapes of the hills. Successful, but not quite what I was after. Here's my second one, a HUGE departure for me and far more what I wanted to accomplish. It's literally huge, for me anyway: 8"x5" on a piece of black Pastelmat paper! I chose to crop and distort the image, pulling it into a much elongated and stylized version that appealed to me. 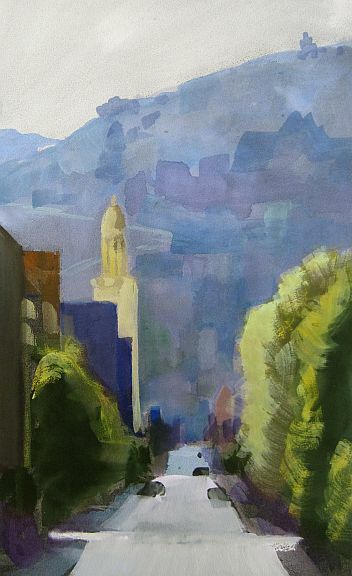 I loved the sense of a street going uphill in stages, and enhanced that with the light coming between the buildings. I probably 'should' have added more shadow shapes of the buildings, but I chose to limit that response in order to keep it simple. I limited my palette, and heightened the contrasting values. Cars? No chance! I just haven't the inclination for those shapes, so I suggested a couple and let it go at that. Do you think it works? Be sure to take a look over at Terry's challenge to see some of the things folks have painted already, and maybe even join in yourself! Edited to add a link to Terry Miura's SIMPLIFY! 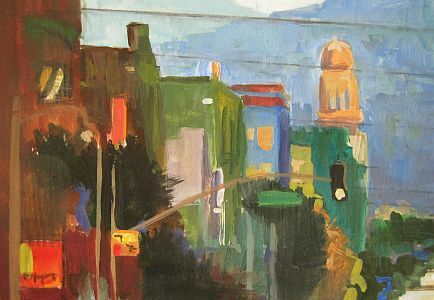 - A Cityscape Challenge where you can see a slide show of 60 paintings, including Terry's beautiful version. I've painted this view at least ten or fifteen times! It's a photo I took over 20 years ago down on scenic Rio Grande Blvd in the valley that runs through Albuquerque. These adobe walls are really substantial, and this one has a window that allows a glimpse of the fields and trees beyond the road. The pink is a little exaggeration of the color, but I like it. This is a romantic little painting, so the sweet colors seem to work. It's definitely "old New Mexico". I hope you like it. This one comes with memories, too, of the many times I drove along Highway 14 on the east side of Sandia, which is dubbed 'The Turquoise Trail', amid these blue and lavender storm clouds with the tawny grasses stretched out in colorful contrasts. Gorgeous! 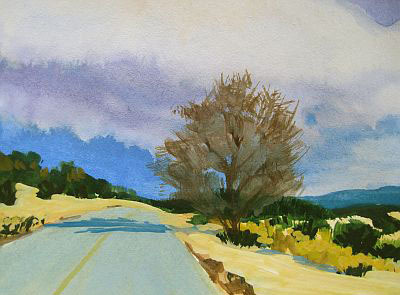 This one is also on Bristol paper (100 lb. in case you want to know), and I'm learning to love how it behaves. I really soaked the paper to do the sky, yet the paint sits on top of the hard paper and mingles differently than it does on the Arches. I have a lot of Bristol ACEO cards, so for now I'm sticking to using it. My favorite part of this one is the way the light clouds drip down over the blue sky on the right there... Hope you like it, too! This is a view of Sandia Peak that I see frequently from my neighborhood. I love seeing the glints of the Rio Grande wending its way along among the trees, and the transparent shadows turning the woods and distant city from blazing pinky-peach to cool blues and greens. You don't often have a sense of the depth of the ranges until you see the deep blue shadows delineating the hills this way. I like the underlying shapes in this painting, defined by their values, of course. I think if you turned it upside down it would still be interesting. That's a little test I often apply to my paintings. 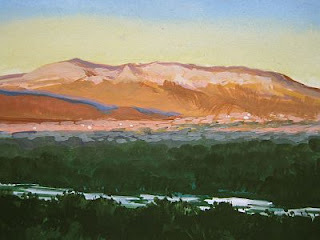 I love the light on the mountain and distant trees because it showcases the area in the turquoise shadows. And the sparkle of the water pleases me, too. I'd like to be sitting there looking at this river in person right now. It's from a photo I took 20 years ago up in the Blanco Basin, near Pagosa Springs, Colorado. 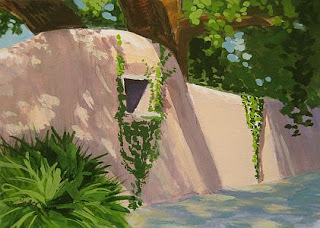 A beautiful spot, it's been featured in many paintings of mine since then! 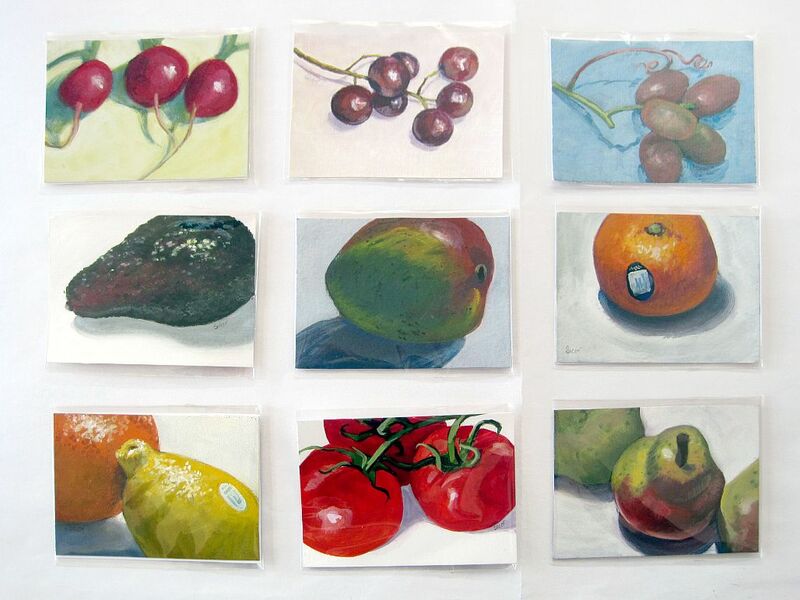 I think I'll put a grouping of these small horizontal ones together as a kitchen painting. This is just a quick snapshot of the paintings I'm considering. I need to further consider the arrangement, but something like this. I don't think the two grapes belong side-by-side. Hmmmm... How would you arrange them? Your opinions are welcome. 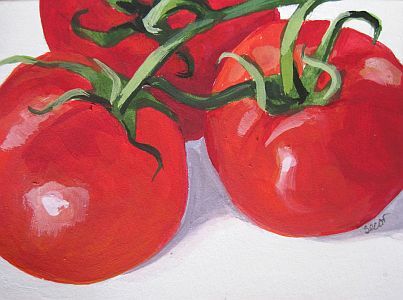 These three just looked delicious sitting in the sun on my table so I had to paint them. I set them on a white sheet of paper so the reds and oranges, contrasting with the different greens and the purple shadows, would just sing out. The squishy highlight on the left tomato pleases me a lot. I think I managed to catch the ripe quality of a soft-yet-firm tomato. Delicious. 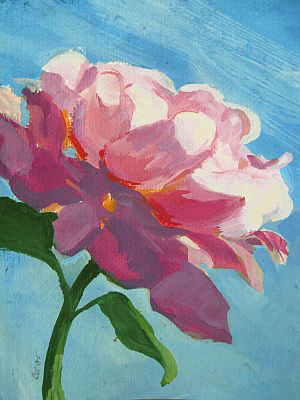 As ever, this painting fits in the palm of your hand, 2.5" x 3.5" in size. Roses have faces to me. 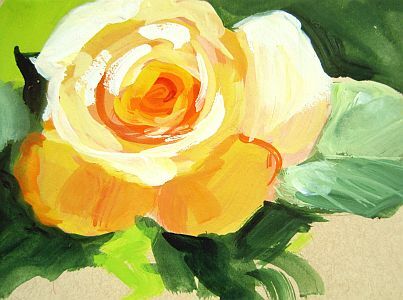 This yellow rose looks you in the eye and smiles, I think. It doesn't take itself too seriously, and just seems to fit in, even surrounded by neighbors that are so completely opposite it. Hmmm, too much personification? Well, maybe, but I honestly find myself thinking these things as I paint. I like this guy's sunny smile, and if I'd thought of it sooner that would have been the title. A little different take, more somber and quiet. 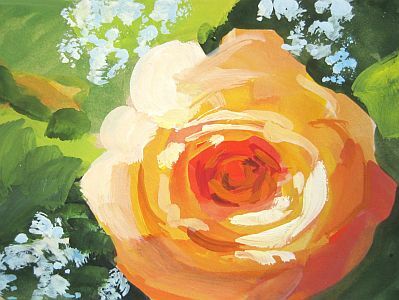 This little sweetheart was tucked into a bouquet of roses, but seems to have a bit of an independent spirit, heading sideways as it is. 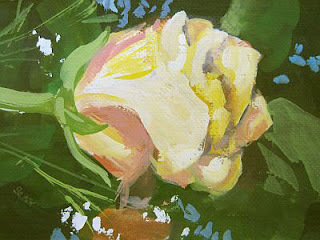 I always enjoy yellow roses, even with a touch of blush on them. 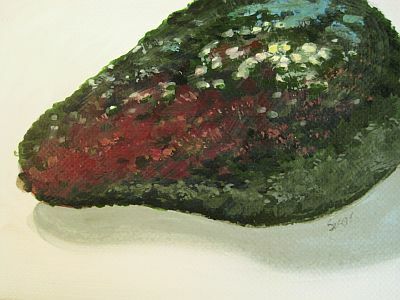 The Canvas Paper makes the gouache look a little like oil paint, I think. That pleases me. I'm pleased with the loose strokes and truthfully I like the striations in the sky. They add a suggestion of movement to it. The big face of the rose looks as if it's just basking in the sunlight to me. Ah! I don't know about you, but I'm ready for spring. 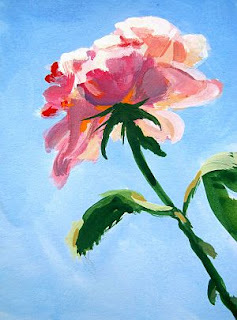 It can't still be winter... Well, soon enough the roses will bloom again, all in God's good time. I have some oatmeal paper that I found at Hobby Lobby. 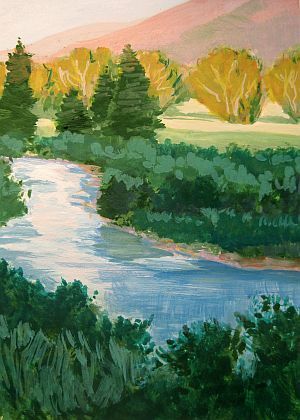 As I was painting this one I decided the paper was the perfect color and value, so I left it exposed. I like the swift, juicy strokes in this sunny piece. It seems to say all I wanted to without over-detailing things. Silly, I know, but the paler green leaf on the right side just pleases me next to the variegation of the rose petal. The contrasting darks do their job well, too. All in all, this is one I'd frame for myself, but then yellow roses are about my favorite flower in the world! I'm including a shot here of some pieces I have yet to post, but I want you to see the scale of these paintings. You may not realize that you're seeing them slightly larger than life sized on the blog, so you can see the details. I think my keyboard will help give you more of a sense of the size. As you can see, these paintings are in their protective plastic bags already, which is why they seem a little dull. I'll give you a closer look at the other paintings here over the next few days. I love this painting! It's so nice to really love a painting from time to time. Oh, I like them all or I wouldn't show them here. But this one just makes me smile. I wanted to capture the translucent petals, as well as the more opaque ones. I didn't want it to be too tightly rendered, but loosely suggesting all that was there. I love the colors, too.